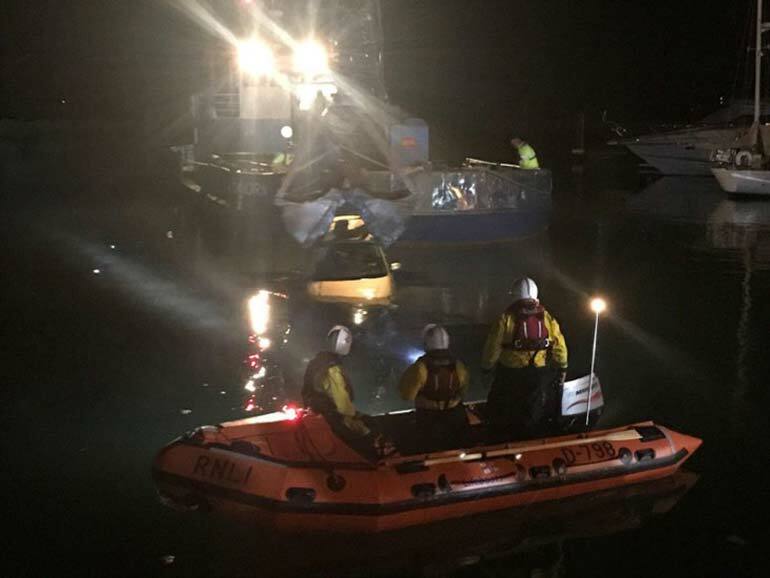 A car was pulled out of Poole Harbour at Fisherman's Dock following a report that a vehicle had entered the water at around 10pm on 15 December. It only took RNLI lifeboatcrew 5-6 minutes to reach the scene at Fisherman’s Dock in Poole Harbour after being tasked by the National Maritime Operations Centre at 10pm on 15 December to a report that a car had entered the water. The vehicle, which appeared to be submerged at an angle was located by RNLI lifeboat crews who searched the area with police, fire and rescue, ambulance and coastguards. After identifying the number plate, information came through that a person had been recovered from the water but there was a possibility that other persons may be unaccounted for. The inshore lifeboat took Dorset Fire and Rescue crew out to the vehicle, where they used an underwater camera to try to search the car that was on the sea bed at that time. Additional lifeboat crew came down from the station to support on the quayside, searching between pontoons and boats for a possible person(s) in the water whilst the lifeboat crews continued to search in the Fisherman’s Dock and Dolphin Haven area. Meanwhile, the harbour control requested the dredger to attend to lift the vehicle from the water. The RNLI lifeboats stood by until the car was recovered and lifted on to the dredger, where it was checked over. Nothing untoward was found and the lifeboats were stood down.